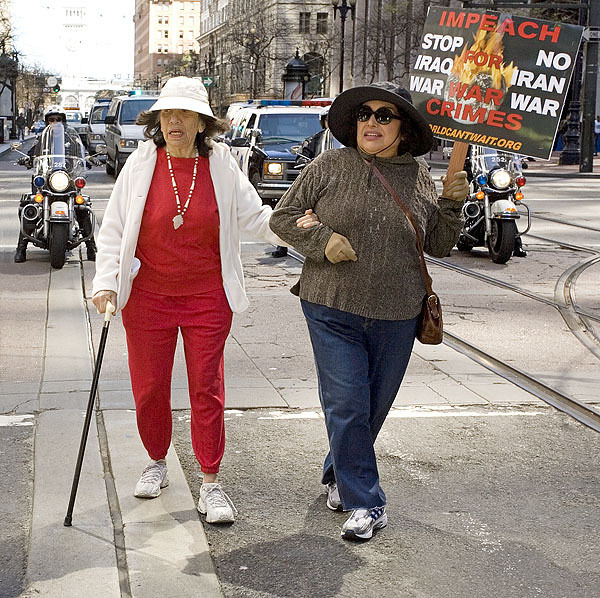 Thousands of concerned citizens gathered at Justin Herman Plaza near the Embarcadero to express their outrage at four years of unconscionable war in Iraq. A rally at the start of the march included short speeches by State Senator Carol Migden, and a member of the Sonoma State research team for Project Censored, as well as local politicians and student leaders. 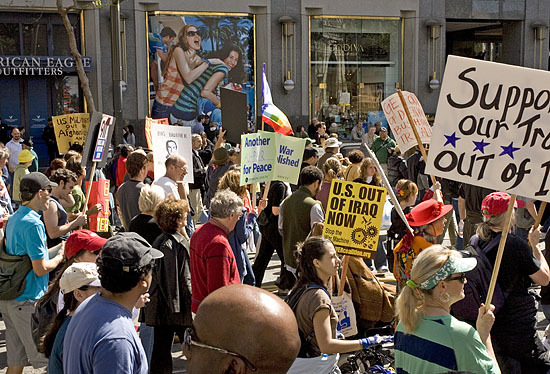 The march led up Market street to the Civic Center, where speakers, notably including Viet Nam era activist Daniel Ellsberg, criticized the Bush administration and US foreign policy. "Act like a Globe, not an Empire!" "The workers' struggle has no borders!" 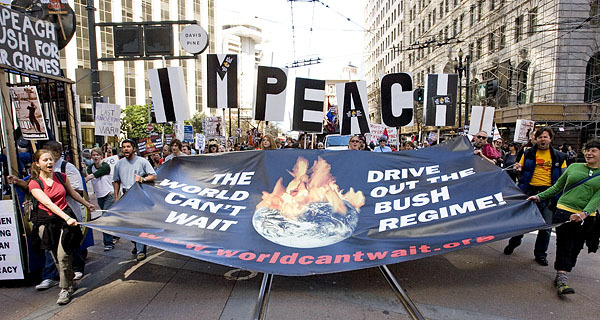 "Sonoma says 'Out of Iraq and Impeach Bush!'" "Civil War Accomplished" "Anything war can do, peace can do better!" "Another Nurse for Peace" and from journalist/activist Molly Ivins' final column:"Hang in there! Keep fighting for Freedom! Raise more hell! Don't forget to laugh!" -Molly Ivins,1944-2007. 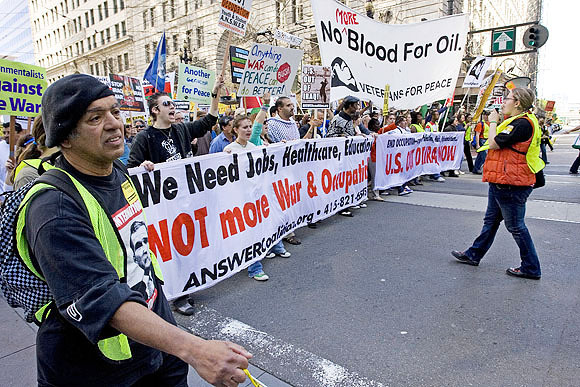 "We Need Jobs, Healthcare, Education, Not More War and Occupation!" led the march to the Civic Center. Elizabeth Martinez, Chicana writer and activist, and Yolanda Lopez, artist and film producer, were the last, though certainly not the least, of the marchers. When asked why they were demonstrating Elizabeth replied, "The US is creating enemies faster than they can kill them." The images of witless fun in advertisements on the stores we passed contrasted sharply with the the purposeful expressions and signs of the anti-war marchers. "War--the ignorant against the innocent" "Evolve or die" "Liar, liar, world on fire" "Kill one person and it's murder--kill thousands and it's foreign policy!" "Prioritize the earth's interest over corporate interests!" Despite House Speaker Nancy Pelosi's declaration that "impeachment is not on the table," the "I" word was frequently encountered. This sign from www.worldcantwait.org could be easily read by the news helicoptors flying overhead. 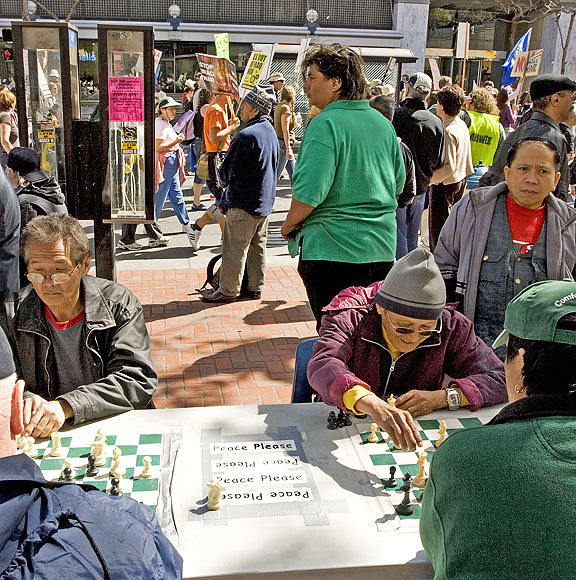 "Peace please" --a silent plea from chess players playing at a sidewalk table along Market Street. 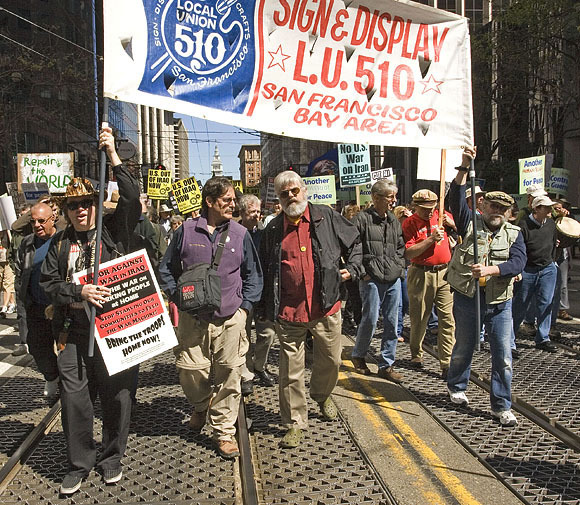 There were fewer unions present at this year's peace march. A larger anti-war march in Washington, D.C. this same weekend may have lured some of them away.